I woke up in Amsterdam and the light on the river and in the city today was really quite lovely. 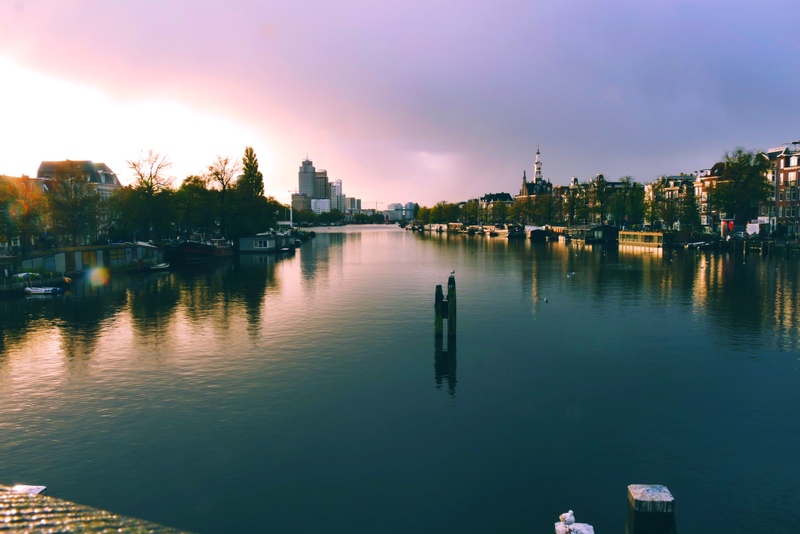 After a few coffees and some pancakes, I finished my book and took a short nap and then we walked to the train station, which just seems like a quintessential Amsterdam stroll down along the Amstel, over some bridges and canals and down past the old buildings to the station. We ended today in Katwijk for Kathryn’s second to last show before we are both on holiday in Italy. Needless to say, I’ve seldom seen Amsterdam early in the morning. The quiet waters of the canals and the soft color of the sky are so peaceful. The never changing central station still looks so regal. I mean it’s just a train station! Of course the food, the ocean, my daughter and you looking so happy, just add to the beauty of my beloved Amsterdam! I’ve loved revisiting Amsterdam with you, dear Chris. I hope your time in Italy is equally wonderful! Thanks! Looking forward to Italy. First a brief stop in Alkmaar tonight. What a great way to start and end your day! From a lovely stroll along the canals to a walk along the North Sea! Good food and nice walks makes for a well spent day! We’re loving the wonderful photos.